Koekelberg may be small, but it contains the sixth largest Roman Catholic church in the world. Construction of the Basilica of the Sacred Heart began in 1905, to commemorate the 75th anniversary of Belgium's independence, and only ended some 60 years later. It is the largest Art Deco building in the world. The basilica is located in the Parc Elisabeth, a 21-hectare park atop a plateau, with a long promenade and old chestnut trees. Adjacent to the park is the Avenue du Pantheon, which is lined with old townhouses and sycamore and maple trees. Several apartments and hotels face the park. The lower half of the municipality was in earlier centuries the industrial part of town, and workers lived there. Today, it is the more populated part of Koekelberg. It is a mixed area (residences alongside small and medium businesses). The headquarters of the world-famous Godiva chocolates is here. Many shops can also be found in the city centre. 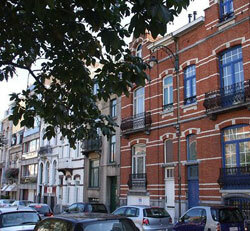 The upper half of Koekelberg, once agricultural, now contains apartment buildings and large houses. About 15,500 live in Koekelberg, making it a relatively densely populated community.